Gretchen Kelsey Brown, co-founder of Athletic Business magazine and chief executive officer of Athletic Business Media, Inc., recently was presented the United States Sports Academy’s 2016 Distinguished Service Award by Academy trustee Dr. Nick Niccolai during the Academy’s 32nd annual Awards of Sport Program held recently on campus. DAPHNE, Ala. – Gretchen Kelsey Brown, co-founder of Athletic Business magazine and chief executive officer of Athletic Business Media, Inc., has been presented the United States Sports Academy’s 2016 Distinguished Service Award (DSA). Given for outstanding contributions to sport, the award was presented recently on campus as part of the Academy’s 32nd annual Awards of Sport program. 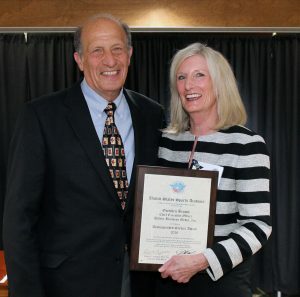 Brown received the award from Academy trustee Dr. Nick Niccolai. After graduation from the University of Wisconsin-Madison in 1973 with a bachelor’s degree in communication arts, Gretchen Kelsey joined the family publishing business. In 1976 she and her father, Fenton Kelsey Jr., launched Athletic Purchasing & Facilities magazine (AP&F), the precursor to Athletic Business. AP&F focused on sports facility construction and management. In 1980 the publication name changed to Athletic Business to reflect the broadening reach of the editorial content. The magazine and parent company, Athletic Business Media, Inc., are based in Madison, Wisc. Athletic Business is read in print by more than 40,000 subscribers representing colleges and universities, high schools, park and recreation departments, military branches and bases, health clubs, YMCAs, professional sports teams, stadiums and arenas, sports architecture firms, and hospital and corporate wellness centers. In recent years Athletic Business has expanded into digital media and live events. The Athletic Business electronic newsletter is read daily by more than 40,000 subscribers and the Athletic Business website attracts more than 200,000 visitors each month. Athletic Business has been at the forefront covering key issues including the growing recognition of the importance of fitness, the mandated inclusion of women’s and girls’ sports programs through Title IX, and the growing demand for and sophistication of athletic, recreational and sports facilities. Athletic Business in 2015 partnered with the National Center for Spectator Sports Safety & Security (NCS4) covering the many concerns related to safety and security. Athletic Business has won numerous awards for its journalistic content, including a commendation from the President’s Council on Physical Fitness for groundbreaking reporting on the birth of corporate fitness and the wellness movement. The magazine also heavily reported on issues surrounding sports product liability and safety, receiving special recognition from the Sporting Goods Manufacturers Association. Athletic Business each year gives Athletic Business Facility of Merit Awards recognizing the best in new facility design and construction as judged by a panel of leading sports facility architects. Athletic Business produced the first Athletic Business Conference in 1982, attracting representatives from colleges, park and recreation departments, the military and private sports and health clubs. When Kelsey married Peter Brown in 1986, he joined the company, taking over management of the Athletic Business Conference and growing it to today’s premier facility-focused event, attracting more than 2,500 attendees and 500 exhibit booths annually. He is currently president of Athletic Business Media, Inc. Athletic Business Media also publishes Wood Floor Business Magazine, the leading publication for the wood flooring industry, and AQUA magazine for the pool and spa industry. Both are leaders in their industries and have vibrant digital components.